Costumes for "A Christmas Carol" at the Clarence Brown Theater were designed by Bill Black. 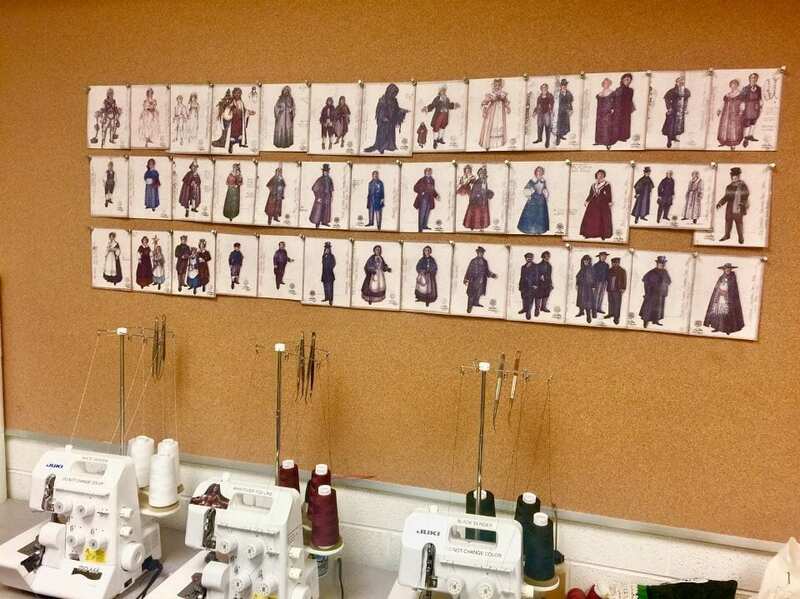 The costume design cards for all of the characters hang on a bulletin board in the Costume Shop. The Costume Shop at the Clarence Brown Theatre dedicates themselves to providing actors with hand-crafted costumes for every production. A behind the scenes look at the wardrobe preparations for this year’s “A Christmas Carol” proved that time, skill and an eye for design are fundamental to providing actors with the costumes to bring their characters to life. “Every script of “A Christmas Carol” is an adaptation that somebody has created for the theatre based on Charles Dickens’ original work,” Melissa Caldwell-Weddig, Costume Shop manager said. The director and design team decide each production’s concept and script before the Costume Shop works on any of the costumes. Kathleen F. Conlin is the director of this production. Bill Black designed all of the costumes for the Victorian-themed production of “A Christmas Carol.” The three rows of design cards for each character hang on a bulletin board in the Costume Shop. The Theatre has used this specific production for the last three years. Members of the Costume Shop go through what is in stock to see what they need to add for the production after the director and designers declare a concept and script. Schelliger either pins fabric onto a dress form or uses mathematical equations to proportion the costume drawings to life-size. The actors try on mock-ups that the costumers alter to fit them. The costumers use the fitted mock-ups to help with the creation of the final costumes. Actors utilize the fitting room to try on all of their costumes that they will wear in the show. Most actors in “A Christmas Carol” will wear an average of three costumes. The CBT assembled a display in the lobby with the costumes for the Ghost of Christmas Past from three different productions. Bill Black designed two of the costumes on display, and Kathryn Rohe designed the third costume. Guests can look at the display and get a sense of how the theme has evolved over the years. The Costume Shop currently does not employ a wig maker, so they order any new wigs that are needed for the shows. Some of the actors have custom wigs made to match their hairline. Wig makers individually hook each strand of hair into a lace material to create a natural hair growth appearance. The CBT’s production of “A Christmas Carol” will begin Nov. 29 and will conclude on Dec. 22. Information about tickets and show times are listed on the theatre’s website.